"We believe that only a chef designed, chef administrated, and chef owned school - very much like a chef owned fine dining restaurant, free of management restrictions - can best provide a personalized and evolving experience for its students." 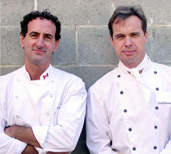 The Northwest Academy is a unique and progressive chef training school built, owned, and operated by its dedicated chef instructors. has instructors that are passionate, enthusiastic, inspiring, attentive, well connected to the industry, and, most importantly, qualified to TEACH. A school is only as good as its instructors! acknowledges and addresses the diverse backgrounds and histories of its students and their varying personal reasons to study this fascinating art and science. focuses its intensive curriculum on greater hands-on skills and necessary aptitudes to succeed in various avenues in this field. creates a challenging learning environment of exciting energy, intense work ethic, study, creativity, and teamwork. offers programs that are affordable, practical, and condensed - without fillers.